Chocolate Chips and Banana are two classic and favorite flavors - combined into one tender muffin they make an amazingly delicious and memorable snack! 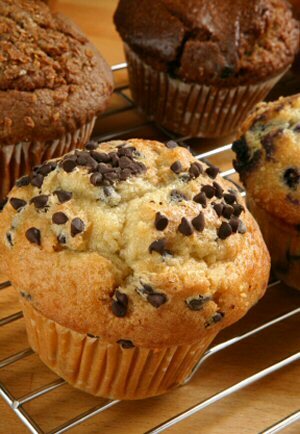 A handful of semisweet chocolate chips and ripe bananas are blended into a simple muffin recipe for a simply sweet snack that makes an excellent breakfast or a hearty afternoon snack. 2. In a large bowl combine flour, sugar, baking powder, baking soda and salt. Set aside. 3. In a small bowl combine egg, oil, yogurt, vanilla and banana and blend until smooth. Combine with flour until just moistened. 4. Fold in chocolate chips and transfer to muffin tins until 2/3 of the way full. 5. Bake for 20-25 minutes or until a toothpick inserted into the center of a muffin comes out clean.